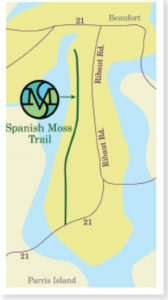 | Spanish Moss Trail: Enjoy the Great Outdoors This Summer! If you enjoy hiking, biking, walking, fishing, dog walking, riding a scooter, skateboarding or rollerblading, don’t miss the Spanish Moss Trail, which connects beautiful Beaufort to historic Port Royal and offers 10 miles of scenic beauty. 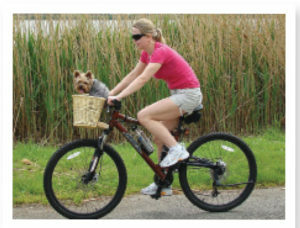 Part of the East Coast Greenway, the Lowcountry’s only paved Rails-to-Trails destination, provides breathtaking waterfront and marshfront views along a flat, 12-foot wide pathway that is open to pedestrians and non-motorized transportation year-round (motorized wheelchairs are welcome!). Six parking trailhead areas are available, and pets are welcome, as long as they are on a leash. In 2009, the Beaufort-Jasper Water and Sewer Authority obtained the right-of-way to use the former railway as a utility corridor. In 2011, Beaufort County secured an easement to establish a recreational trail that would appeal to locals as well as visitors. Thanks to the generosity and foresight of local residents and businesses, the Spanish Moss Trail attracts outdoor enthusiasts from near and far. Today, the 10-mile trail cuts through Spanish moss-draped neighborhoods and woodland tracts. When the Spanish Moss Trail is fully developed, it will be approximately 16 miles in length. Don’t miss the opportunity to explore the natural beauty of the Lowcountry on the Spanish Moss Trail. Whether you’re on foot or on a bike, you’ll make memories that last a lifetime! The Spanish Moss Trail is open daily from dawn until dusk. Learn more at spanishmosstrail.com.